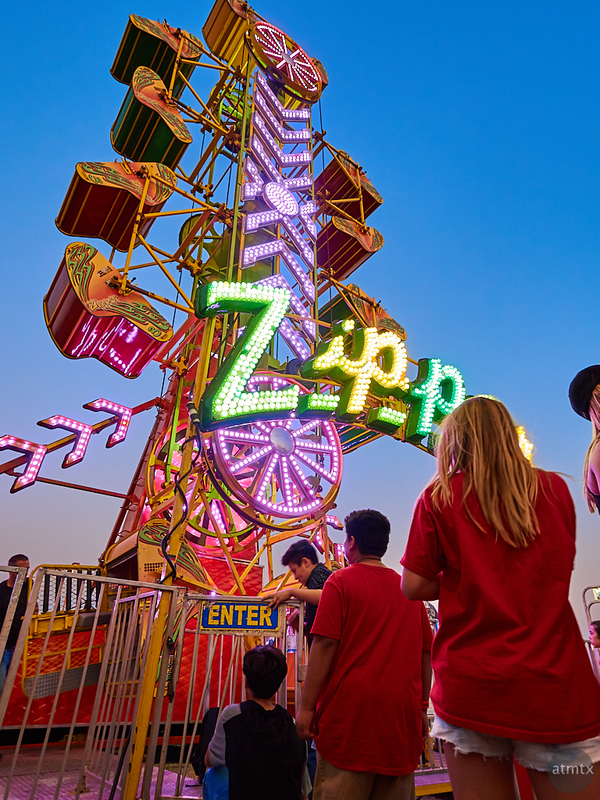 Behold the Zipper, a torture device cleverly disguised as a colorful amusement park ride. I’ve notice a lot of these so-called rides at Rodeo Austin. Many riders and many screams. They seem to like being tortured, paying good money for the privilege. Me, I’m just attracted to the color, especially at dusk as it approaches the blue hour. As I’ve done recently, I’m trying to push the bounds of dynamic range processing. This is a single image, post processed with Capture One. I exposed for the colorful lights and recovered the shadows. Shot with my wide-angle with the Olympus OM-D E-M5 Mark II. As it’s customary for me, as blue hour approaches, I switch from people photography to shooting the colorful carnival rides. While in the past, I used a tripod, I’m continuing my experiments going tripod-less. It wasn’t hard here, since it wasn’t very dark but it became increasingly challenging, which I’ll show in subsequent posts.